Leonard B. McDonald was born Feb. 2, 1837 in Jefferson County, Alabama, the son of a Baptist minister, Allen McDonald. 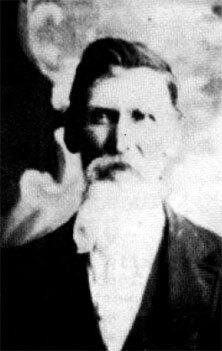 Leonard McDonald originally enlisted in the Confederate 18th Alabama Infantry and took part in the Battle of Shiloh, Tennessee. He stated he left the regiment in the summer of 1863 although it is not known why. He then enlisted in the 1st Ala. US Cavalry on March 10, 1864. He was shown as absent without leave on Aug. 31, and was thought to have been a prisoner of war since Aug. 9. During the Atlanta campaign, Leonard McDonald had a nephew that was a member of Hood's corp in Joe Johnston's army. When he returned home to Jefferson Coumty after the war's end, it was said he was not well liked. He later migrated to Texas where he died on Dec. 12, 1907. He is buried in Mason, Texas. Picture submitted by Alan Dowdy.